Frame rate is capped at 30 FPS. Can be fixed. The game has severe sound issues on all PC configurations and all sound systems types. Can be fixed. Resolutions above 1920x1080 may have major issues. Can be fixed. The game may crash when using Alt+Tab ↹ in fullscreen. See Windowed. A patch that fixes the majority of the problems this game faces. See the bottom of the download page for the password. Overwrite the original file when prompted. Turn on Vsync via GPU settings if you have any trouble. 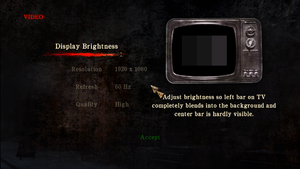 Start the game normally and set the resolution of your monitor in the options menu. Exit the game. 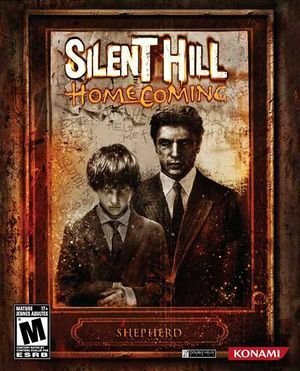 Configure the width and height and other options in Silent_Hill_Homecoming_PC_Fix.ini. In-game video settings. Video quality can be set to either Medium or High, the latter resulting in slightly better textures and shadows. Use Unknownproject's Patch to fix the map and examined inventory items. Use Silent Hill Homecoming PC Fix by Steam006. Enabled by default. Can be forced off using graphics card control panel. Capped at 30 FPS. Use Unknownproject's Patch. Change ScreenResHeight= and ScreenResWidth= to the desired resolution. Click on Options and enable Expert mode. Click on Edit and Add. Set the path to <path-to-game>\Bin\SilentHill.exe. Set Desktop if you want borderless fullscreen windowed. Click on the Hook tab, and change the injection mode to Debugger mode. Click on the Input tab. Set Cursor visibility to Hide. Set Cursor Clipper to On. Select the Remove Film Grain option. Key mappings are stored in the individual save game files rather than a normal configuration file. Needs to be manually enabled from the configuration menu. Go to the controller settings in the game options and select to use the controller rather than mouse and keyboard, and then press Escape to exit the controller configuration menu. Generic DirectInput controllers are supported. The game may crash in certain areas, such as entering the Shepherd House. Fullscreen mode defaults to 60 or 100 Hz, even if the screen refresh rate is set higher than that. Open <path-to-game>\Bin\d3d9.ini or %USERPROFILE%\Documents\My Mods\SpecialK\Profiles\SilentHill.exe\SpecialK.ini depending on the installation method you used. Change speaker settings to surround sound 5.1. Alternatively, a "Headphones" setting might resolve this issue as well. If this does not work, you will have to download a sound patch for the game, see below. This game does not support any speaker configuration other than 5.1, that's to say you will need to patch the game in order for it to work if the workaround above didn't help. Install the patch linked to above. Config the sound settings for your pc after the install. Download ENBSeries version d11 patch. Extract file vars_pc.cfg to <path-to-game>\Engine\ (replace old one). It's strongly recommended to never set quality level to High in the video options. ↑ 2.0 2.1 File/folder structure within this directory reflects the path(s) listed for Windows and/or Steam game data (use Wine regedit to access Windows registry paths). Games with Steam Cloud support may store data in ~/.steam/steam/userdata/<user-id>/19000/ in addition to or instead of this directory. The app ID (19000) may differ in some cases. Treat backslashes as forward slashes. See the glossary page for details.